Smaller than the Ultra Mini Ugly, tinier than Lil Other Brother, Baby D is the cutest just-hatched duckling you’ll ever want to give away. 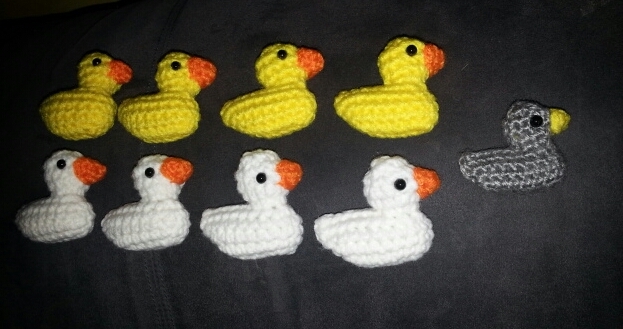 The latest duck I’ve been making for The Little Yellow Duck Project, Baby D is a really small version of Darryl – a duck and with only 11 rounds for the body and head and another 2 for the beak, he works up in well under an hour, like a half hour or less. 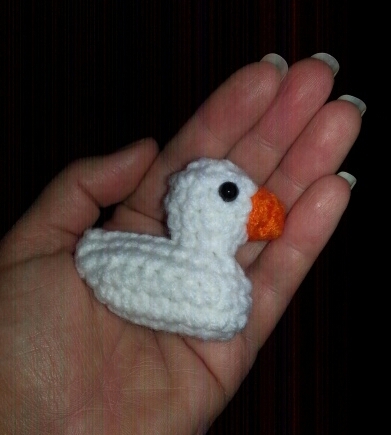 Like some of the other mini ducks, Baby D is a great size to be used as a bag charm, backpack clip, or key chain. Add plastic safety eyes 1 row down from the top, 4SC apart. Weave tail through front loop of Round 11 and pull tight. Tie knot and pull into head. Sew beak onto head with running stitch. Yesterday was the 8th Annual Rubber Duck Derby during the Healthy Kids Day celebration in Tarrytown, NY. 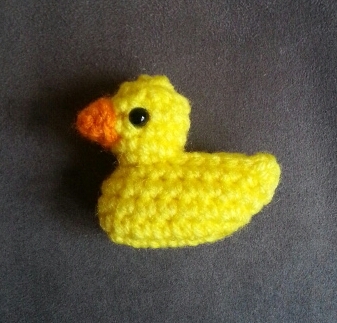 It was the perfect opportunity to release ducks “into the wild” as part of The Little Yellow Duck Project. In my attempt to be inconspicuous, I did not take pictures of the released ducks, but I did look on as several were discovered. I was able to capture some of the very exciting Rubber Duck Races, in case you’re wondering what a rubber duck race looks like. I know another rubber duck race got major exposure over the past few days. If you get a chance to go to one, I would recommend it. They’re just fun.